Update, May 9: Twitch Prime subscribers will receive another load of free Fortnite goodies today. In March (see original story, below) Twitch gave their Prime members some exclusive items – now they’re at it again, with a bunch of gear including a new Freestylin’ dance emote. If you want to get better at Fortnite, here’s our guide to everything you should know about the game. The items in Twitch Prime Pack #2 include a Trailblazer outfit, True North back bling, Tenderizer pickaxe, and the aforementioned emote to help you tear up the dance floor.You can redeem them here. If you’re not a subscriber, here’s all the best skins and cosmetic items you can buy with your well-earned V-bucks. However, despite the big Avengers: Infinity War crossover going on right now don’t expect to see Captain America, Iron Man or Spider-Man costumes any time soon. Update, March 28: Twitch are adding more Fortnite content to their Twitch Prime package. Last month, Twitch gave away two free Fortnite skins (and a new glider) to Twitch Prime subscribers. Now, they’re giving away even more, starting with a brand new pickaxe. 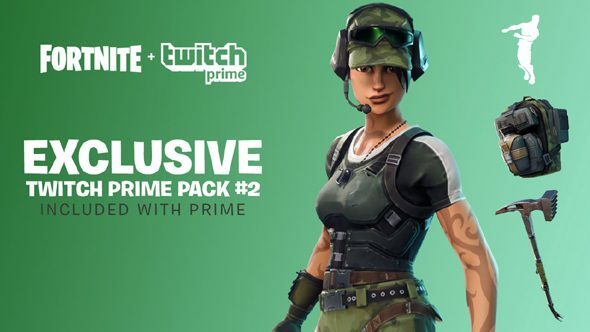 A tweet from the Twitch Prime account last night said that from tomorrow, a new item will be available through the Fortnite Twitch Prime pack. The razor-sharp, exclusive, Instigator pickaxe will be the first new item to be added to the pack since its release, which featured two skins, a glider, and some emotes. Twitch also confirmed that they’ll be adding even more loot to the pack over the coming weeks. If you’ve already accessed the pack, the pickaxe will be available in-game as soon as you log in. If you’ve yet to get your Fortnite goodies, you can do so once you’ve linked up your Twitch and Epic Games accounts. Original story, February 28:Free things are great, so here’s a free thing (if you’re subscribed to Twitch Prime, anyway): there’s two free outfits, called Sub Commander and Havoc, going out to those who have paired their Twitch and Epic accounts now. Exactly how long the promotion will last for is currently unclear, as the service is, conveniently, down, but it will probably be for a couple of weeks. The outfits work in both the original Fortnite mode (aka Save The World) and Fortnite Battle Royale, but, of course, it’s probably the latter you probably care about more. You can see the characters above, with Havoc being the dude on the right, and Sub Commander being the dude on the left. Havoc comes with his own Back Bling, and Sub Commander comes with the glider that you can see above – the four little pictures in the bottom left of that picture are four new Twitch emotes for you to use at your pleasure. It’s no PogChamp, but, y’know, it’s nice to have them. There’s currently some technical issues at the time of writing, with Epic’s website being down – it might be best to wait a few hours and come back to Twitch after to see if you’re able to unlock the free gifts then. Once it is up, though, all the details will presumably be available on Epic’s site for the Twitch Prime pack.